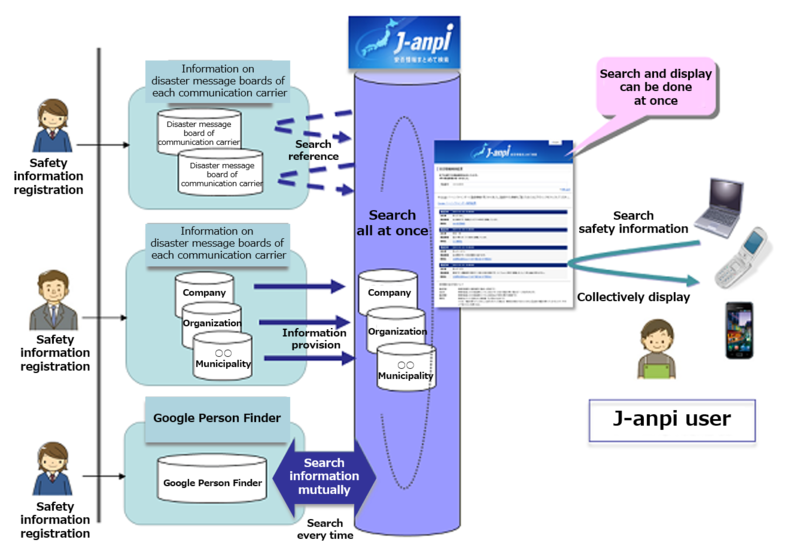 J-anpi is the portal site for searching safety status information by “telephone number” or “name” across the safety status website provided by the press, companies, organizations (*1) and carriers(*2) and Google "Person Finder"(*3) for free(*4). You can use J-anpi through PC, smartphone and cellular phone. J-anpi also provides search form for finding safety status confirmation for infomation providers. The people who want to confirm safety information of their family and friends can search it all at once. J-anpi is online all times including non-emergency and information providers are able to upload information by general file format (e.g. CSV, XML); therefore, you can use the site at once after a disaster occurs. Also, J-anpi servers are working at multiple location for reliable service. *1: Safety information website provided by Nippon Telegraph And Telephone East Corporation, Nippon Telegraph And Telephone West Corporation, NTT DOCOMO Inc., KDDI Corporation, SOFTBANK MOBILE Corporation. *2: Safety information provided by Japan Broadcasting Corporation (NHK), Nippon Telegraph And Telephone East Corporation, Nippon Telegraph And Telephone West Corporation, Japan Post Co., Ltd, and so on. *3: Google Person Finder is a web application that allows individuals to post and search for the status of relatives or friends affected by a disaster. *4: You have to pay Internet access fees. Basically, you can use J-anpi at any time. However, when all safety information websites provided by carriers are offline, and no information are provided by the press, companies and organizations, you can't find any information on the site. In that case, we display so on the home page. You can use through PC, smartphone and mobile. However, stability of display/operation may not be ensured according to PC environment/browser settings. It may not be used from some smartphone and mobile depending on its model. You can search and view safety information for free on J-anpi. Internet access fee, internet service provider fee, and dial-up connection fee is required separately. This site is provided with the cooperation of the companies and organizations above, and others. Copyright:(C) 2015 NTT Resonant Inc. All Rights Reserved.